Access control automation is particularly adept at offering solutions to sites and fields that need security control or automatic check-in, especially for organizations hosting temporary outdoor events. Ursalink helps connect assets for water and wastewater treatment facilities around the globe to help automate and remotely manage critical systems in their facilities through high performance M2M wireless communications. Ursalink router delivers connectivity for IP cameras. The high bandwidth wireless connectivity enables real-time full motion video and high resolution picture transmission, which allow security professionals to view a location in real-time with priority to take action. Remote alarm monitoring allows false alarms to be disregarded without incurring the cost of going to the location as well as avoiding false law enforcement dispatch. Lighting the streets and public spaces in cities around the globe is one of the biggest expenses for local governments. Ursalink enables intelligent street lighting systems to remotely monitor and manage pertinent electrical parameters and control the lights. 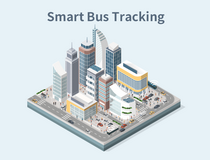 Bus passenger counter is an efficient approach to collect the data of people flow, which will be helpful for government to optimize the bus route, and make better decisions for the construction of public facilities.